for Delphi. Kalavria is quite larger than Sphairia and is planted all over. Sphairia is a volcanic rock. In mythology times Aithra founded in Sphairia the temple of Athena Apatoria in honor of her encounter with the god Poseidon. In the north part of the island there are the ruins of Poseidon's Temple, which was built in 520BC. 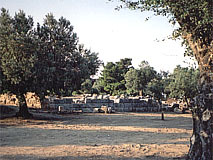 The main Temple was built in Doric style, though some of its columns were Ionian. Nearly the Temple there was the built up area of Kalavria. of city-states in both civic and religious matters, which included Hermione, Epidauros, Aigina, Prassies, Athens and Orhomenos. the King of Macedonia chased him.